Must first be Special Summoned (from your Extra Deck) by shuffling the above cards you control into the Deck. (You do not use "Polymerization".) If Summoned this way: You can Special Summon 1 Level 7 or lower "Gladiator Beast" Fusion Monster from your Extra Deck, ignoring its Summoning conditions. 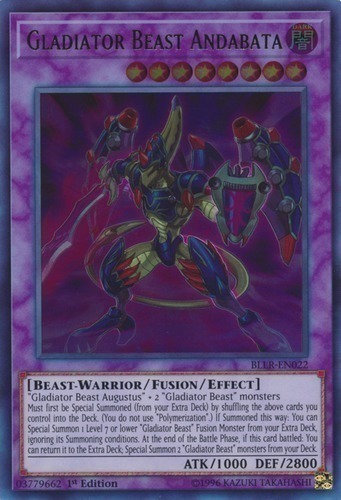 At the end of the Battle Phase, if this card battled: You can return it to the Extra Deck; Special Summon 2 "Gladiator Beast" monsters from your Deck.